JillyFoo Demon Eater, The Planet Closest To Heaven) joins Fes, Tanya, and Mark this week. 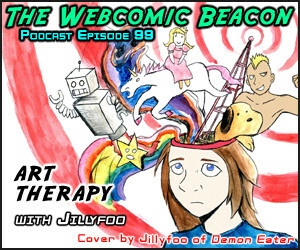 Jillyfoo goes over art therapy, and even goes into analyzing the hosts comics! 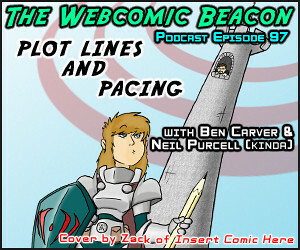 VOTE NOW for who will win the Webcomic Beacon’s WAGON Webcomic Battle TCG Contest! Milestones: The Dreamland Chronicles (1000), Spud Comics (1 yr) and Rival Angles (300) JinxTiger (Tally Road NSFW) joins in as the Chat Room Monitor. Robot Pavilion, Ardra, Becky Card Vote, Holiday Cooking Project, Webcomic Bacon, Peter is the Wolf, Marsh Rocket. 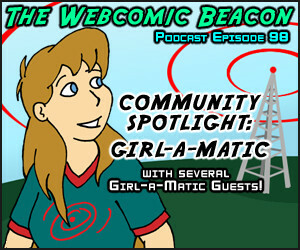 Diana McQueen (Spades), Ira Marcks (Witch Knots), Kory Bingaman (Skin Deep), Michelle Mauk (Mad Sugar & Voyage Moyen) and Terry & Lisa (Godseeker) join Fes and Mark for a Community Spotlight on Girl-a-matic. Tanya was out sick. Milestones: Addanac City (400), Capes and Babes (2 yrs), Tally Road (NSFW) (400). Ben Carver (Point Guardian and Hero Academy) and Neil Purcell (Dasien and Crossoverlord) join Fes and Mark to discuss multiple plot lines and story pacing. Kurt Sasso (aka Vertigo) of TGT Webcomics and Jinxtigr of Tally Road (NSWF) call-in and share as well. Thanks to Zack of Unamused Comics for the cover art! The original Multiple Plot Lines Question can be found on The Webcomic List Forums here. Milestones: Pure and Hidden Truth (1 yr), Two Kinds (5 yrs). WAGON Webcomic Battle TCG, Promotional Card! DrunkDuck, Comic Genesis, El Goonish Shive, Casual Notice, Sarah Zero, Wagon Webcomic Battle Cards, Card Art Contest, KaBlam, Indy Planet, The Bess Effect, Coyote Dance, TGT Webcomics, Yahoo Groups, Google Docs, Tally Road (NSFW), Girlamatic. Nic Buxom (Nic Buxom) joins Fes, Tanya, and Mark to discuss fetishes and such. Had a little technical difficulty here and there, but overall a fun listen! Rampage Network Featured Comic: PC Weenies Milestones: Pure and Hidden Truth (1 yr), Ordori Park (100), Red Moon Rising (100), Zorphbert and Fred (300), Silly Daddy (500). Wagon Webcomic Battle Cards, Webcomic List Awards, WCRCA (Webcomic Readers Choice Awards), Peter is the Wolf, Collar 6 (NSFW), Slipshine (NSFW), Oglaf (NSFW), Autumn Lake Halloween Special (podcast).